1. International Airport pick up (on the day of arrival at Kathmandu). 2. Meeting at Hotel and trek preparation (31st of March). 3. Fly to Lukla 2840m (30 minutes) and trek to Phakding 2610m/3hrs (Visit Pema Chholing Monastery in the afternoon) (1st of April). 4. To Namche 3440m/6hrs (View of Kawande peak) (2nd of April). 5. Hiking to Everest view hotel and visit Hilary school, Khumjung monastery and Khunde village etc (Training day: climb high altitude during the day and sleep low at night) (3rd of April). 6. To Tengboche monastery 3860m/5hrs and Tengoche monastery. (Views of Mt. Everest, Lhoste, Nuptse, AmaDablam, Thamserku, Kangtenga and Kawande peak etc) (4th of April). 7. To Dingboche 4410m/5-6hrs (splendid view of Mt. Lhotse and Island peak) (5th of April). 8. Training day: climb high and sleep low (6th of April). 9. To Labuche 4910m/3hrs (splendid view of Mt. Nuptse). Visit Italian pyramid (investigation about growing vegetation from Everest to K2 in the Himalaya) in the afternoon (7th of April). 10. 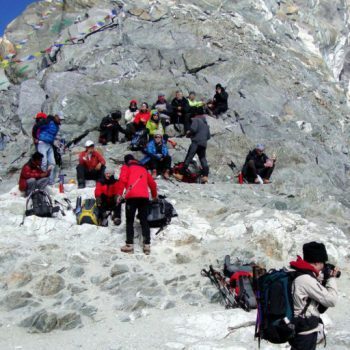 To Everest base camp 5364m/5hrs and back to Gorak shep 5140m/2hrs (8th of April). 11. To Kalapattar 5545m/2hrs in the early morning to see close views of Mt. Everest, Lhotse, Nuptse, Pumari and Khumbutse etc. and to Dzongla 4850m/6hrs (9th of April). 12. To Cho La 5330m high pass to Thanak 4700m/7hrs (500m up hill and 700m downhill walk: Cho La 5368m pass is harder than other day) (10th of April). 13. To Gokyo Lake 4790m/2hrs crossing via Nagazumba glacier (the biggest glacier in Nepal Himalaya) (11th of April). 14. To 4/5th Gokyo Lake in the morning (splendid view of Mt Cho Oyu) (12th of April). 15. To Gokyo Ri 5368m/3hrs to see best panoramic views of Mt. Everest, Lhotse, Makalu, Cho Oyu and money more mountains etc and decent to Dole 4200m/7hrs (13th of April). 16. To Namche 4hrs (14th of April). 17. To Lukla 7hrs (15th of April). 18. To Kathmandu by flight in the morning (16th of April).